Learn about the different types of jewelry the ancient Egyptians wore and handle the materials they used to make their jewelry. Jewelry was used to demonstrate faith and status. Their jewelry was handcrafted by artisans who specialized in jewelry making. The Egyptians wore jewelry to call on certain deities for protection, in addition to wearing it on a day-to-day basis. 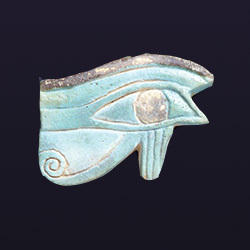 The Eye of Horus – This symbol became a popular because of the myth regarding Horus. Horus lost his eye in a battle with Seth, the deity of chaos, while he was avenging his father, Osiris. Thoth, the deity of knowledge, restored his eye, so it was given the name Wadjet, meaning whole or healthy. The eye of Horus was often used to symbolize sacrifice, healing, restoration, and protection. There are several different versions of the myth that could be referring to the left or right eye. 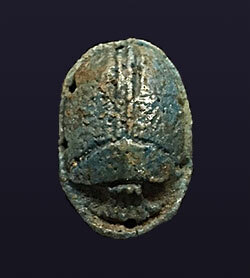 Scarab Beetle – The scarab represented the deity Khepri. When the Egyptians saw the scarab beetle rolling balls of dung across the ground, they associated this with the forces that move the sun across the sky. Khepri also represented creation and rebirth because the Egyptians observed juvenile dung beetles emerging from the dung ball. Due to this belief, the scarab beetle was a common funerary amulet placed inside the mummy wrappings. It was meant to protect the person’s heart on their journey into the afterlife. The Egyptians used many different types of materials, including natural and man made products. Join our Jewelry workshop to see examples of these materials every 1st Sunday of the month at 12:30 pm! You will learn how certain minerals, precious stones, shells, metals, and styles served specific functions for an ancient Egyptian’s daily life and their afterlife.